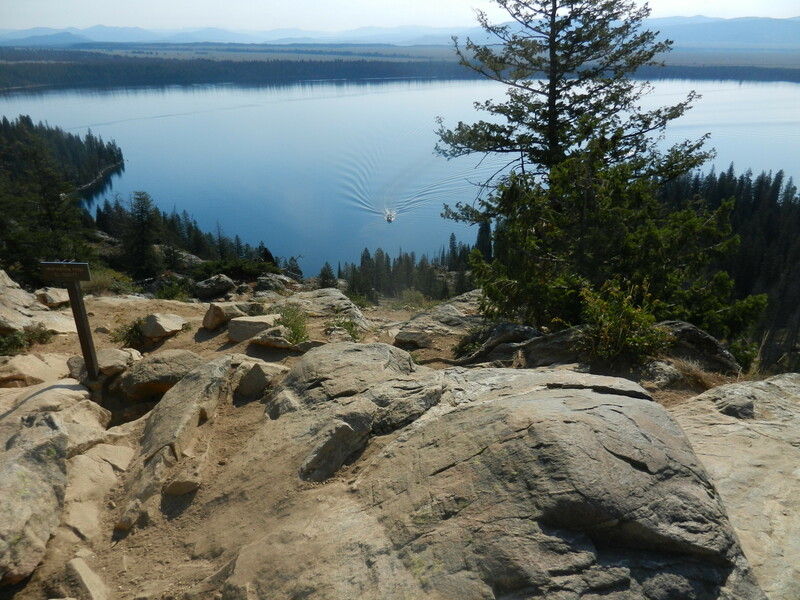 Jane suggested we hike up to Inspiration Point, so Jane, Linda, Tony and myself left early to head on over to Jenny Lake. We hopped on the ferry there which took us to the trailhead. 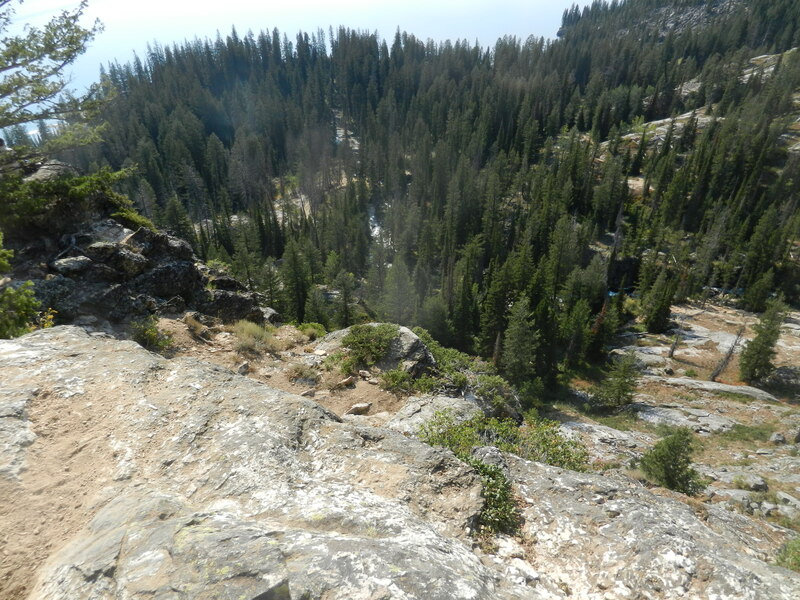 It is a steep trail for the first .7 of a mile as it has an elevation gain of 417 feet. 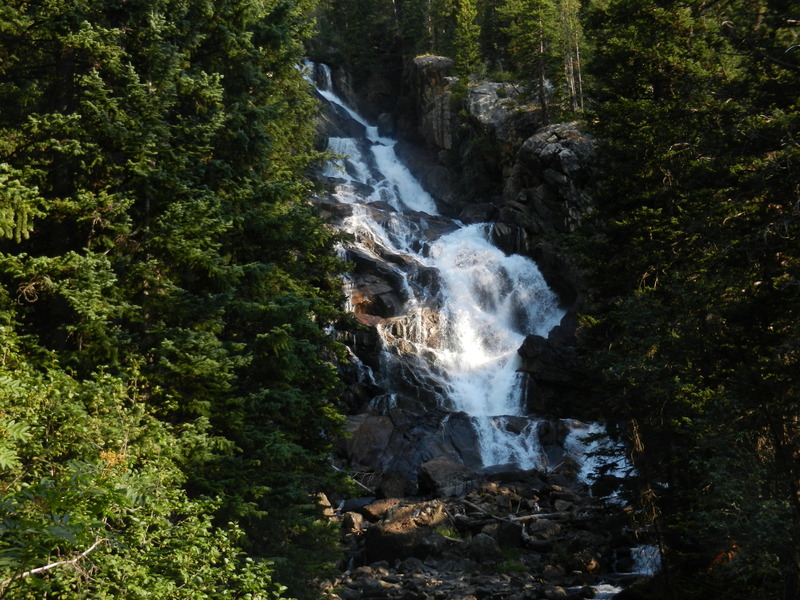 We saw this waterfall going up the trail. 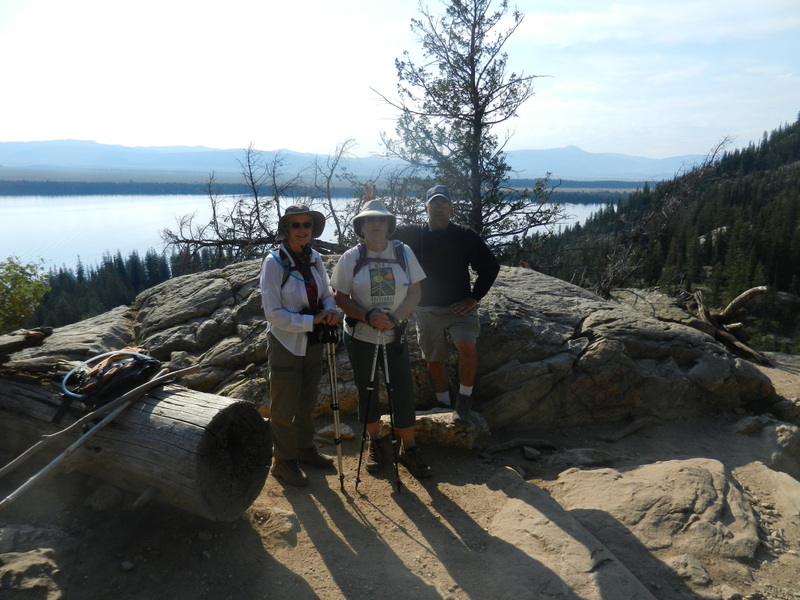 We stopped for a break before hitting the top where I took this pic of my hiking companions Jane, Linda and Tony. This next pic shows the trail we have come up thus far. However we are still not at Inspiration Point. In this next pic you can see the ferry landing at the boat dock. We will end the trail at the same boat dock to go back across the lake. 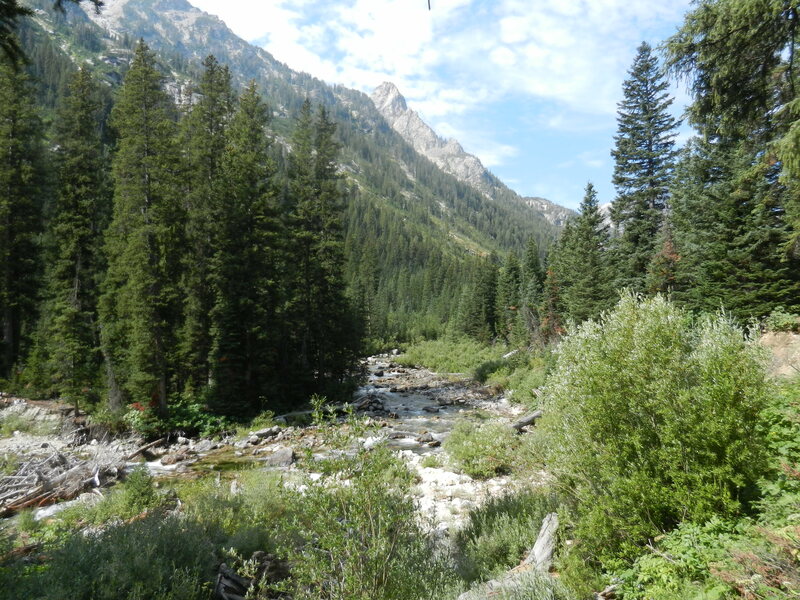 Now we are on the Cascade Canyon trail that leads way back into a canyon between the beautiful mountains. 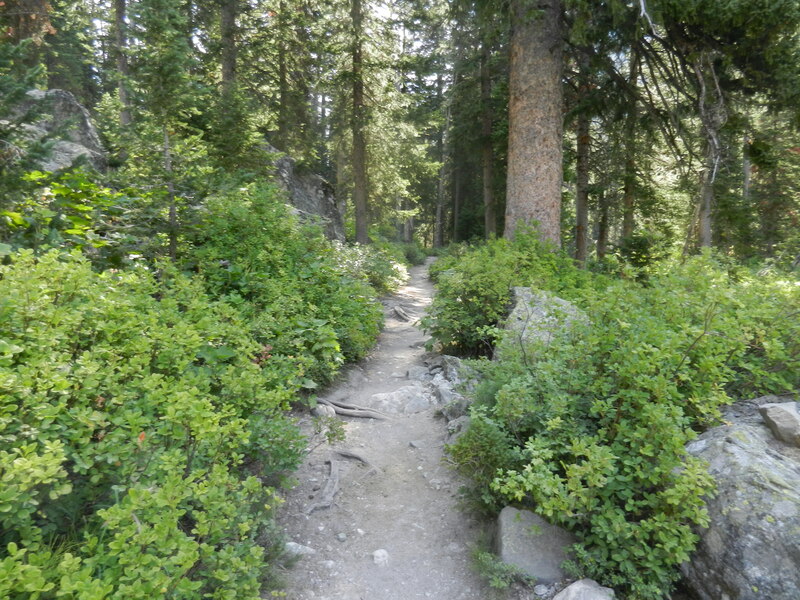 This is a pic of the trail. It was mostly flat and not difficult at this point. We ran across a large pond and were hopping to see some moose drinking. There were a lot of people on the trail at different times and it must have scared all the wildlife away. 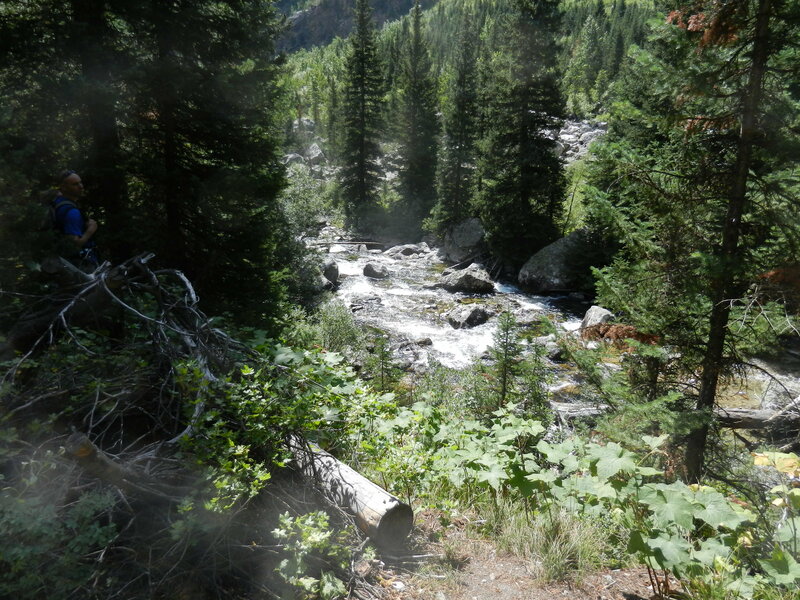 Luckily we did not come upon a bear, but we were all equipped with bear spray just in case. Jane and Tony are much faster hikers so they decided to go ahead down the trail while Linda and I set our own pace. We did run into several hikers with large backpacks that had spent the night way up on the mountain. 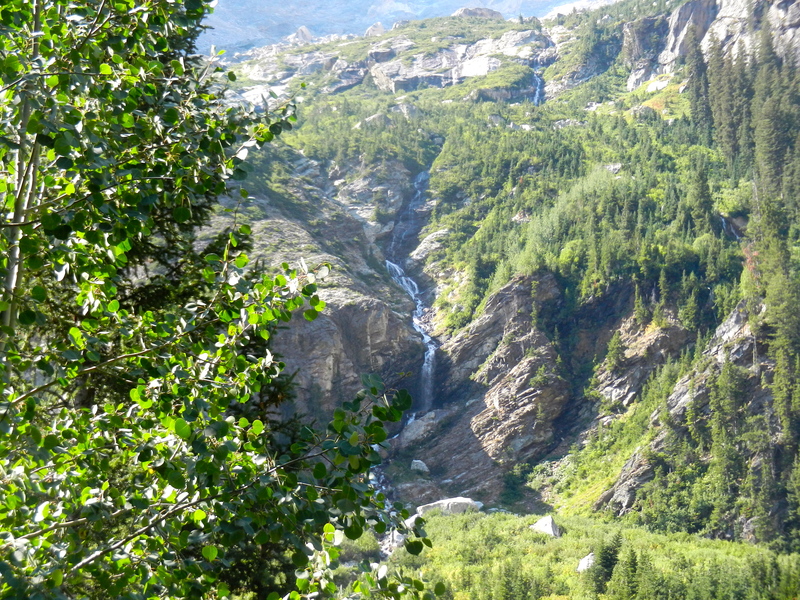 We could see many different waterfalls all along the trail. 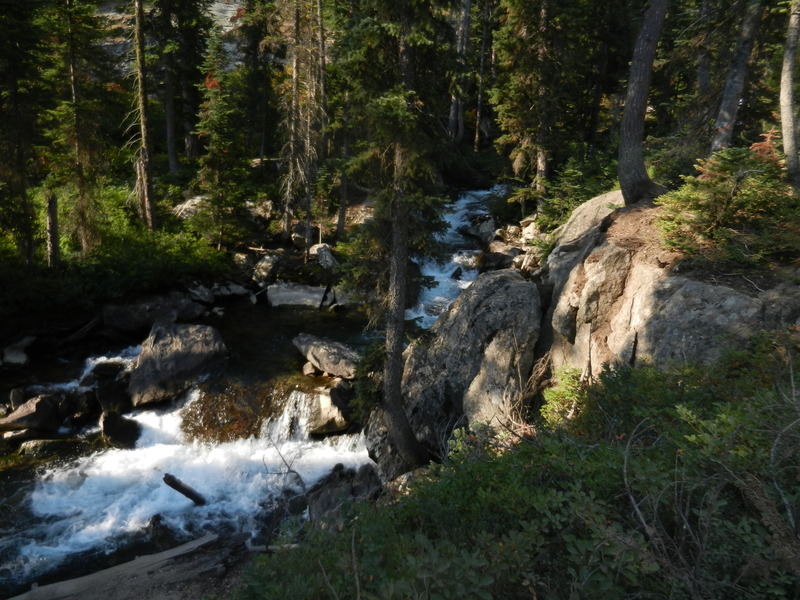 There were also several pics of the creek that we followed. This was a great experience. 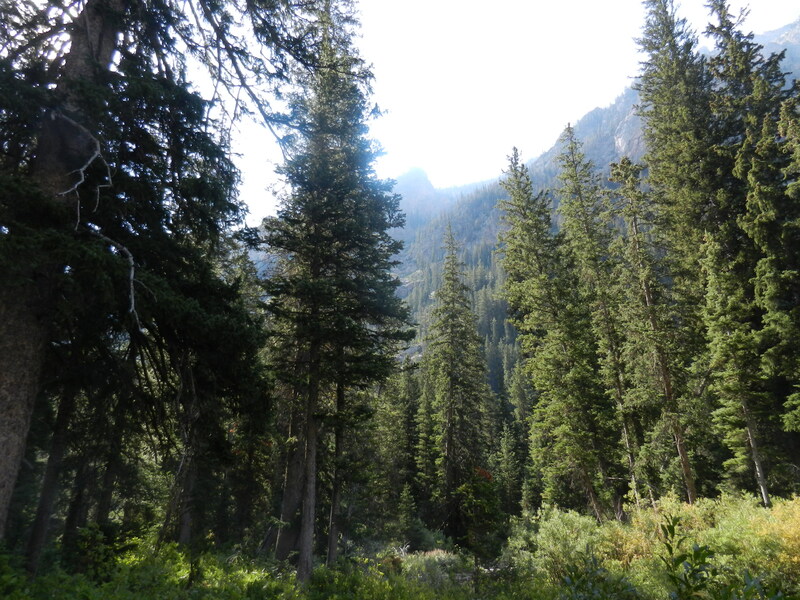 Of course we had to hike back and down the same elevation gain that we came up. It was almost more difficult climbing done then it was going up as there were many people making the climb up. We then got on the ferry for the ride back across Jenny Lake. Then Linda and I went to Dornans at Moose Junction for a much needed pitcher of water and a pizza and sandwich. It turned out to be a great day. We hiked 8.6 miles over hill and dale (HA!) and saw some great scenery. Not too shabby for an old fart like me. 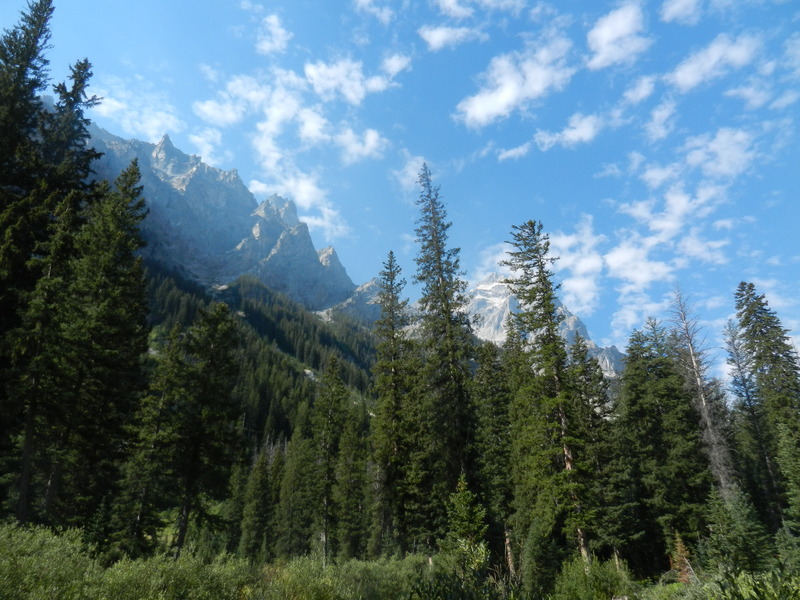 This entry was posted in Cascade Canyon Trailhead, Grand Teton National Park, Gros Ventre Campground, Hiking, Inspiration Point, Wyoming and tagged Cascade Canyon, Hiking, Inspiration Point, Wyoming by Jim Melvin. Bookmark the permalink. Nope, not too shabby for all of you! Looks like a great hike. 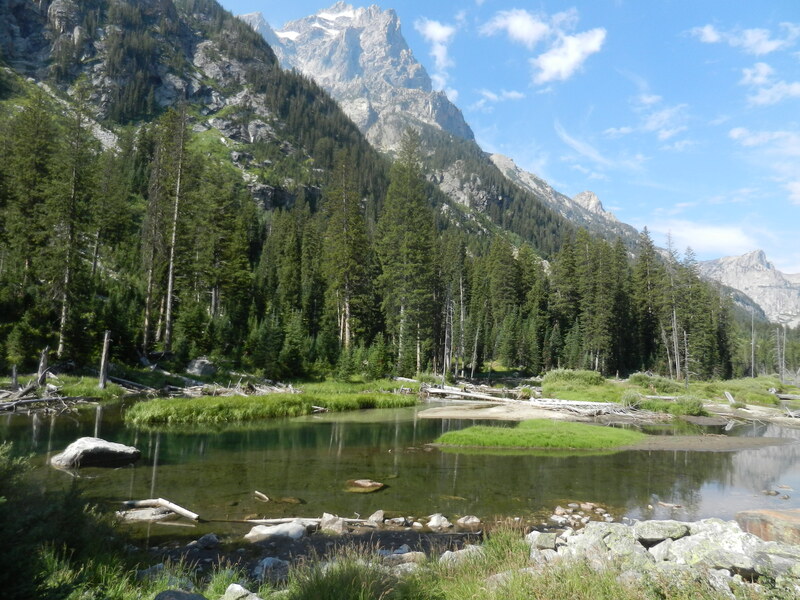 We just have to get back to the Tetons. Not sure I could make a hike like that, but I might try. Some really beautiful country up there. Thanks for sharing. Heh, old fart, you did well! Talk about God’s Country. So very beautiful!